Looking for a good salt scrub recipe? You can use ingredients from your own refrigerator and cupboard to make a great smoother for your skin. Salt scrubs exfoliate the skin. The gentle abrasive action of the salt scrubs away dead skin cells, revealing the softer skin underneath. Exfoliation helps prevent ingrown hairs, allows moisturizer to penetrate more easily, and gives skin a rosy glow. The salt for your scrub doesn't have to be fancy. For a basic salt scrub, you can use simple table salt! For a more luxurious feel choose a finely textured sea salt, which you can find at the grocery store. You can also find packages of dead sea salts or other bath salts at beauty and cosmetics stores, or even in the bath aisle at the drugstore. You may need to grind these salts for a finer consistency. Kosher salt, with grains a little larger than regular table salt, works too, and it's extremely affordable. You can use just about any oil in your salt scrub recipe. Which one to choose depends on what consistency you want, how long you need to store your scrub, and how you want it to look and smell. Almond oil is delicate and smells great, but it spoils quickly. Don't use it if your scrub is going to sit around for a while, or if you're planning to give it as a gift. Almond oil could cause an allergic reaction especially in those who are allergic to nuts. Olive oil will keep longer and will calm skin irritation. It will feel "oilier" at first, but will absorb into the skin. Olive oil is beneficial to skin with its high content of vitamins E and A.
Canola oil isn't fancy, but it works. Massage oils are made specifically for use on the skin. Choose one with a scent you like, or choose an unscented one and add a few drops of essential oil. Be sure to read the ingredients list if you are allergic to nuts. Many massage oils are made with almond oil as the base oil. Mineral oil is one of the safest oils you can use on your skin, even the most sensitive skin. Contrary to past belief, mineral oil will not clog pores. Other options include sunflower oil, grape seed oil, and jojoba oil. Essentially, you can use whatever strikes your fancy. You may need to experiment to find out what makes the best-feeling scrub for you. One of the pleasures of a salt scrub is that it leaves your skin not just soft and smooth but smelling great. When you create your own salt scrub, you can mix in whatever scents you choose. Essential oils add a strong scent with just a few drops. These oils are available in a wide range of choices, including almond, citrus, mint, and floral scents. Some essential oils can be irritating to the skin, so make sure you research your chosen scents before adding them to your scrubs. Lemon, lime, or orange peel can add a citrus scent. The basic recipe for a salt scrub is easy. 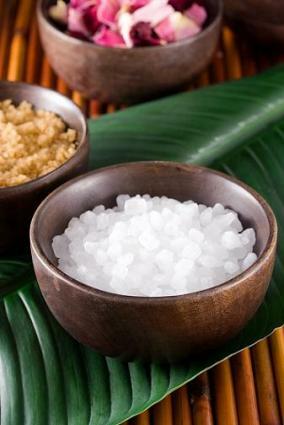 For a firmer, less runny scrub, try two parts salt to one part oil, and then add oil to reach the consistency you want. Don't be surprised if the salt and oil separate. Just stir them back together before you use the scrub. You only need four or five drops of scented essential oil. Too much will irritate your skin. You can mix and match scents if you want to. Try citrus and mint, ginger and lime, apricot and almond, or whatever sounds good to you. Adding another exfoliant, such as oatmeal or cornmeal, requires cutting back on the salt or adding a bit more oil. Try a quarter-cup of your second exfoliant for each cup of salt. Different recipes call for different amounts of soap. Some add one tablespoon per cup of salt. Others add more, sometimes replacing some of the oil. Try a quarter-cup of soap for each cup of salt, cutting the oil back to 3/4 cup. Then alter the proportions until you get a texture you like. To use your scrub, simply rub it gently onto your skin before you shower. It should feel rough but not painful. Don't scrub too hard or too long: you just want to rub away the dead skin cells, not the entire top layer of skin. Be careful in the tub because the oil will make your bathtub slippery. After you're finished, shower as usual then apply a gentle moisturizer. Your skin should feel soft and fresh, with a hint of the fragrance you chose.